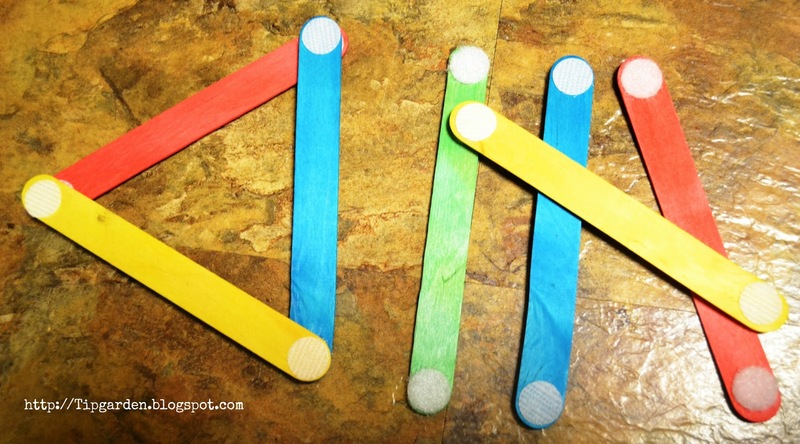 Take 5 minutes to turn these colored craft sticks into velcro sticks for your young one. Busy Bags are a way of keeping young ones occupied and busy during moments where you want them to be quiet, like in a doctors office, while you are in a short meeting, etc. can be challenging. Creating busy bags (little bags with activities that they can play with) that only come out during these times can keep them interested for a long time. I needed to put together a little birthday gift for a coworkers toddler. I turned to this great blog for toddler ideas. As you know there are 2 kinds of velcro to make up one set. The rough prickly side, and the softer fuzzy side. The rough side sticks into the fuzzy side. on one side of your stick, put a "rough" sided dot one at each end of the stick, then flip the stick over and put the "fuzzy" sides on the other side at each end of the stick. Each stick should now have a "rough" velcro side and a "fuzzy" velcro side. Store them in a bag or container. Toss into your purse and you are ready for the next long wait in the Doctors exam room! Jan's Tip: Making this thrifty idea even thriftier: I have found most of the national chains of craft stores have a 40 or 50% off coupon in the Sunday paper. 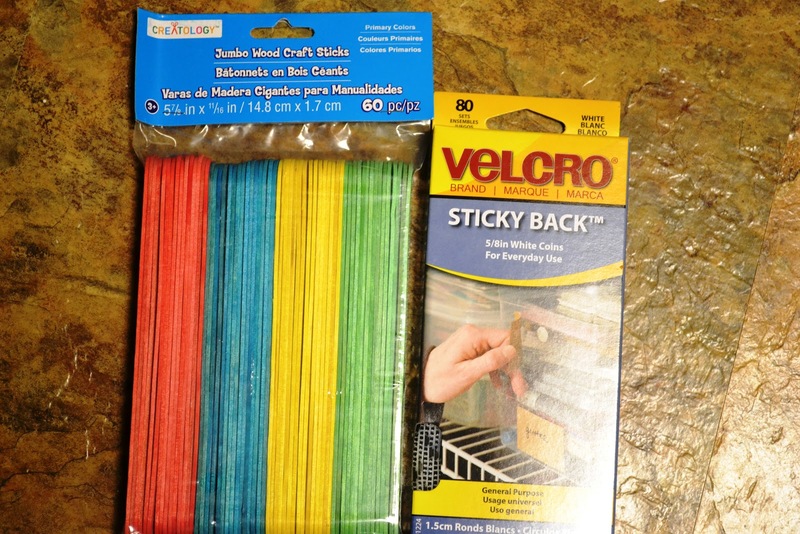 I used a 50% off one and bought the craft sticks for only $1.50. I divided my craft sticks so that I made 3 sets of Busy Bag Sticks for 3 different gifts. 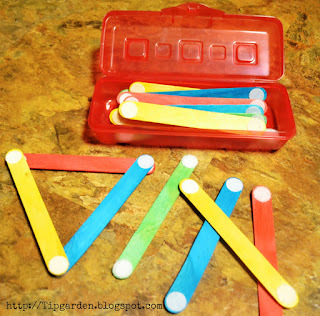 This gave me 5 sticks of each color in every set, so 20 sticks per set. I found a 40% off coupon from JoAnn Fabric for the Velcro dots. I bought a box of 80 sets of dots, which was enough to make 2 busy bags. I need to run out for 40 more dots to make the final set of sticks. (so if your counting you'll need 120 sets of Velcro dots to make the entire bag of craft sticks) the box of 80 dots final cost was $4.20. The little plastic pencil case I got for 50 cents from the back to school sales. So with the cost of the case the gift was $2.10 per gift and took only 5 minutes to make! Woop, Woop! This is a great idea! I think that my youngest would definitely enjoy something like this. Busy bags are not something I have really thought of before. Thanks Heather! I'd love to hear how your little one likes them if you do make them, let me know! What a fun idea! I found you on the Barn Hop and I would love to have you join the fun on my Creative HomeAcre Hop! I'd love to stop by and join up on your hop! I'll try to pop over there this evening, thanks for the invite! Love this! Thanks for sharing on The Creative HomeAcre Hop! That is so fun! My 3 yr old would love this. Thanks for sharing! My 15 month old granddaughter loves pulling them apart when I stick them together. She pulls the bag of sticks out of her toy box and brings them to me, ignoring all the other toys.